A 13-year-old girl descends into a dark world while investigating the mysterious disappearance of her classmate. 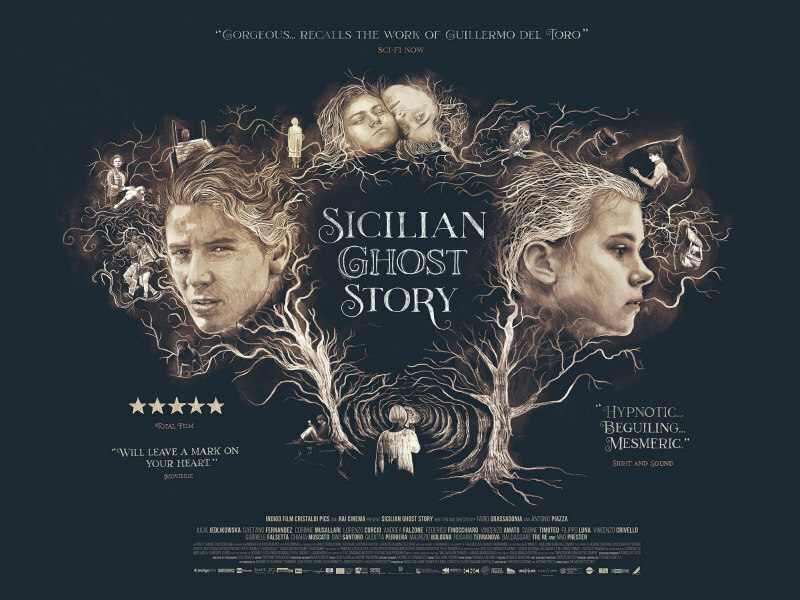 In Sicilian Ghost Story - their follow-up to 2013’s prize-winner Salvo - co-directors Fabio Grassadonia and Antonio Piazza evocatively interweave the richness of a dark fairy tale with the brutal reality of a true event - the abduction of a child. The film is based on the kidnapping of 12-year-old Giuseppe Di Matteo in 1993. He was held prisoner by the Sicilian Mafia for 779 days in the hope of silencing his informant father. The fictional element comes in the form of the character of Luna (Julia Jedlikowska), who feels the powerful stirrings of ‘first love’ for her classmate Giuseppe (Gaetano Fernandez). She follows him into the woods outside their village and secretly observes him transfixed by a butterfly that has landed on his hand, while a playful ferret nuzzles at her heels. The woods are mysterious and magical it seems, but not entirely safe - Luna disturbs a ferocious Rottweiler who, maddened by bloodlust from a rabbit he has been gnawing upon, menaces her until Giuseppe distracts the beast by throwing down his rucksack, allowing the pair to run away to safety together. Luna’s Swiss mother Saveria (Sabine Timoteo) knows her daughter has a crush on Giuseppe, and disapproves of it, possibly because his father was an erstwhile member of the Mafia gang that runs the town, or possibly because his father has now turned police informant. Saveria (whose name sounds all too similar to ‘severe’) is styled like a Wicked Stepmother with her black hair parted in the middle and pulled back, her cold eyes, and her voice, which is soft yet menacing. Luna has a better relationship with her father, who is more easy-going and indulgent - a constant source of exasperation to her mother. When Giuseppe vanishes, Luna searches frantically for answers, but is confronted by secrecy or indifference. The code of fear and silence is so strong, even among those not involved with the Mafia, that everyone turns a blind eye to Giuseppe’s disappearance except for Luna, who refuses to give up her desperate search. Giuseppe has been kidnapped by ruthless Mafia heavies disguised as policemen. Under the pretext of seeing his father, they bring him to an isolated and abandoned house where he’s kept chained to the wall. His Mafia captors hold him as collateral in order to stop his father talking to the authorities. Young actress Jedlikowska gives Luna such an ardour and urgency, that we are carried along with the sweetness of the affection between the two protagonists (in the movie they’re 13 and 14) and fear for their safety, with good reason. The two seem to share an undefinable link manifested through fairy tale symbols - a forest, a cave, various animals, a lake. Both escape into dreams to find each other, and in this fantasy existence a mysterious connection is formed. As Giuseppe’s imprisonment drags on and his situation becomes more dangerous, Luna’s desperation to find him leads her to descend into a dark dream world which has the lake as its secret entrance. Fantasy and reality merge as Luna’s obsession grows ever stronger. While the fairy tale elements of the film are obvious, there are also echoes of the myth of Persephone, whose mother Demeter wandered in desperate search for her kidnapped daughter. In fact, the town where the film was shot, Troina, is not far from Lake Pergusa, where Hades supposedly abducted Persephone and through whose waters he dragged her down to the underworld. Unsurprisingly, underwater shots figure throughout the movie, along with the autumnal forest. Animals also play a part in Sicilian Ghost Story, particularly a small owl which first appears in Luna’s cave-like basement. The owl is associated with Hades. Ovid’s description of it is as a ‘sad omen to mankind.’ Here it is indeed a witness and herald to tragedy. Although directors Grassadonia and Piazza eschew magical kingdoms populated by mythical creatures, comparisons with other films, particularly those of Guillermo del Toro, may be made. Del Toro’s Pan’s Labyrinth combined fairy tales with the reality of Spanish fascism. Sicilian Ghost Story revolves around the stranglehold that the Mafia have on the people of Sicily. Grassadonia and Piazza prefer to ground their evocation of fairy tale in actual countryside. Nino (Andrea Falzone), one of Luna’s friends, remarks that Sicily was once the playground of the gods, but that perhaps the island should now be destroyed and left for the animals. What is implied, is that what was once a paradise is now populated by living ghosts, people who have been so corrupted that they can allow themselves to be haunted by inhuman acts perpetrated under their very noses. The contrast between the dreamy existence of the two young lovers, and the horrific reality of their predicament, adds disturbingly to the understanding of what was a real kidnapping. 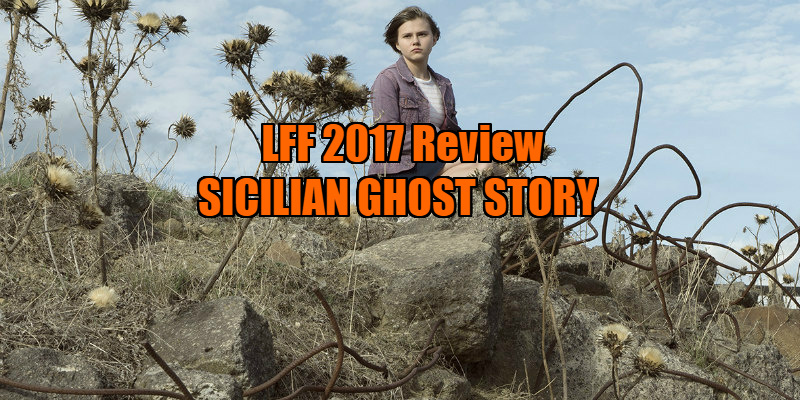 Sicilian Ghost Story doesn’t simply tell a tale of love, violence, grief and loss, but is also a critique of a society which allows brutal acts of inhumanity and injustice to go ignored and unpunished. Sicilian Ghost Story is in UK/ROI cinemas August 3rd.